Slightly larger than a normal-sized rice bowl, this handcrafted ceramic bowl will instantly provide an earthy atmosphere to your tableware collection. Naturally colored with a pale green that is reminiscent of Spanish moss, this small Japanese rice bowl is perfect for consistent use, as it is dishwasher and microwave safe, making cleaning and food preparation more convenient than ever. In large part, this Japanese rice bowl is green, but with close inspection, one can see the light blue speckles that are aimlessly spread throughout the entirety of this bowl. 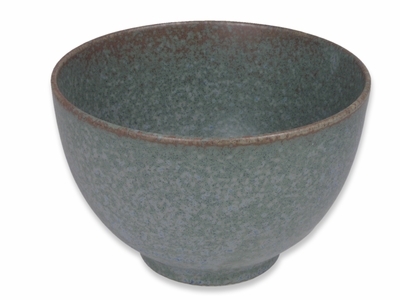 Furthermore, this Japan-made bowl’s brown rim completes its natural look. Rather than the usual glossy texture that most rice bowls have, this bowl has a smooth, papery texture and subtle ridges to help with better hold. Though this Japanese rice bowl is the perfect size to hold larger portions of rice, soup, or your favorite dessert, it can also be used for portion-controlled servings if you find yourself needing a bowl that is ideal for holding a smaller meal. Paired with a Moss Green Japanese Plate and a Moss Green Japanese Mug, you can create a cohesive dining set that resembles the majesty of a forest. If you don’t think this beautiful bowl belongs on your dining table, its large depth also makes it a great option as a pot for cacti and other plants. Invite nature into your household with this practical and splendid Japanese rice bowl!